On transport large & small and journeys far & wide, the Timbuk2 Wander Pack is a great companion to have by your side. It's a nice one bag travel option, but a couple harness & strap system issues exist with the backpack. You’re going on a trip. 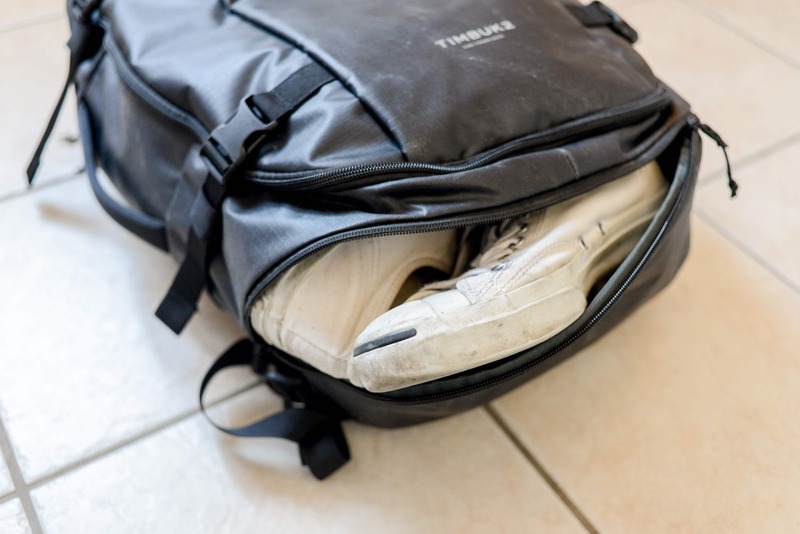 You have to bring things: clothes; shoes; electronics; toiletries. You have a decision to make, a question to answer: what type of vessel will I choose to carry all my items? Some choose a suitcase, others a duffel bag. But you don’t do that. You go a different route, off the beaten path, to places where suitcases and duffel bags don’t belong, but where you and your newly chosen backpack do. Which pack did you choose? If it was the Timbuk2 Wander Pack, you’ve made a wise choice. The Wander Pack is Tumbuk2’s foray into creating “a legitimate backpacking pack.” If you read that statement and pictured a pack that’ll accompany you up a mountain with a sleeping bag and tent attached to it, your imagination would be spot on. 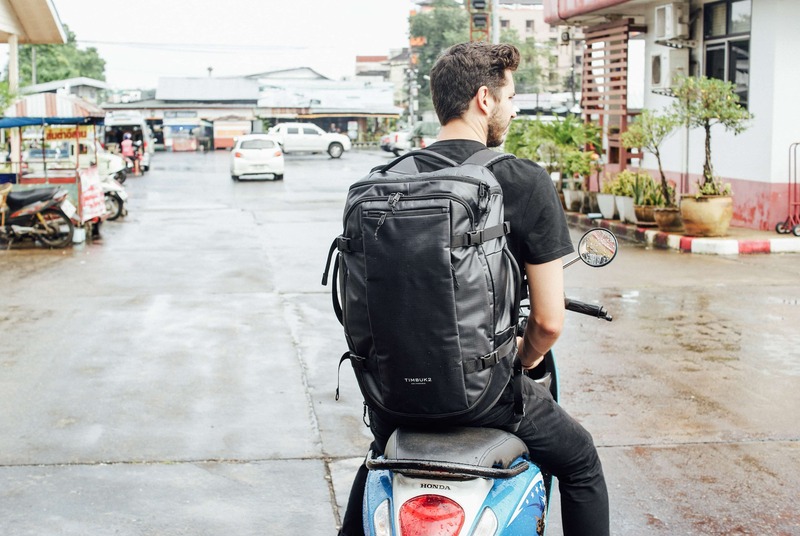 But in the real world, the Wander Pack is more aptly described as a travel backpack for digital nomads. Semantics aside, this is a great pack with attractive high-level details. 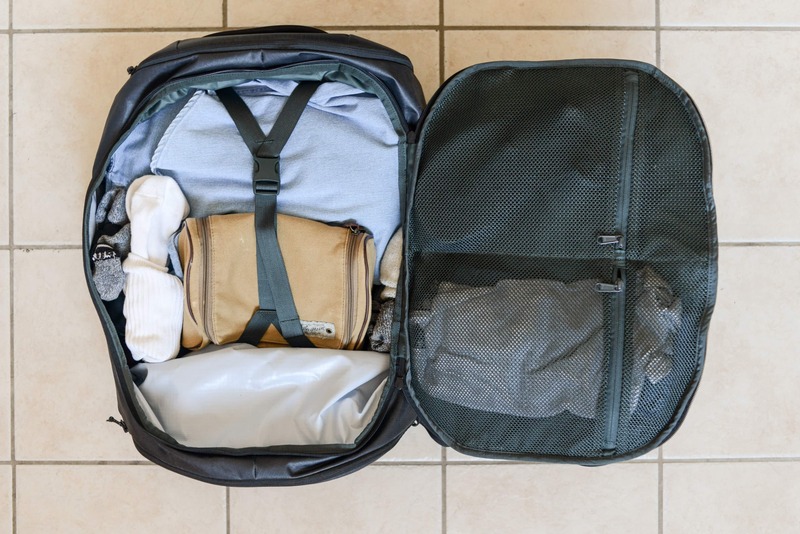 It’s got a 40L capacity, measures 15” x 22.8” x 7.5”, and weighs 3.7lbs; it’s small enough for a long weekend and big enough for months-long travel. The two colors, Jet Black (the one we tested) and Surplus, both look great. 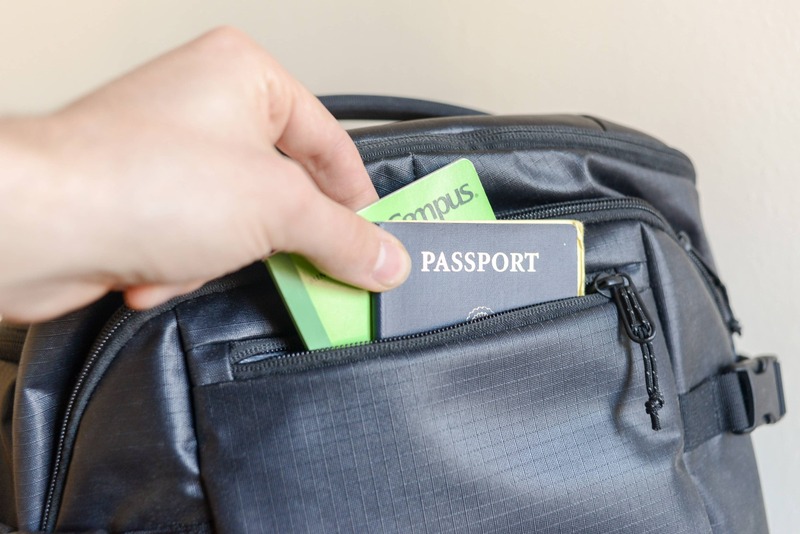 It’s carry-on compliant for both major international airlines as well as small, regional ones. The construction is solid, made from water resistant 420D Ripstop nylon. And with Timbuk2’s lifetime warranty, one needn’t worry about durability nor lifespan (though results on when something needed repair seem to be mixed). Getting down to the nitty gritty, the Wander Pack boasts some excellent, well thought-out design in conjunction with ample storage and organization. The main compartment unzips all the way in a traditional clamshell style. Note here the hinge is on the right side, not on the bottom, where you may be used to seeing it. Another benefit of this is that the compression straps on the hinge-side can always stay buckled. Inside this main space is a compression strap, useful for compressing your load once you’ve packed everything. And on the piece of the pack that folds open are two mesh wall pockets, great for smaller items that require some organization. Turning to the features outside the main compartment, the Wander Pack possesses an overabundance of zipper pockets (all zippers on the pack are YKK). There are five in total: a wet pocket or shoe compartment on the bottom; a quick-access pocket on the top; two other quick-access ones on the front, one small and one medium; and the last is accessed via the top as well. This last one opens along the back edge and extends down along the back of the pack, and in here is the laptop compartment. The wet pocket/shoe compartment is a very handy, multi-use feature. Store wet or dirty clothing in here, or maybe some stinky shoes that have undoubtedly been wet many times before. Whatever nastiness you decide to put inside, it won’t come into contact with anything in the main compartment thanks to a layer of thick nylon that’s both highly water resistant and, in our experience, smell proof. The first quick-access pocket on the top is great for smaller items, like boarding passes, granola bars, hand wipes, or a laptop charger. There’s also an interior mesh pocket within this pocket! Far out. The two other quick-access ones on the front are both smaller than the one on the top and contain no other pockets within. That’s ok though, as they’re great for other things, like your passport, some medicine you may need quickly, or the book you’re reading. The final pocket is where you’ll find the laptop compartment. It’s padded and can hold a 15” laptop. There’s a decent-sized pocket within here, too, with a key clip sewed in. This key-clip detail is something Timbuk2 doesn’t list on the Wander Pack product page. Finding this detail was a nice little surprise. A designated place like this means less time digging through your pack for your car or house keys at the end of a long trip. Rounding out the features are a sternum strap, stowable shoulder straps, two side handles, and four compression straps. The shoulder straps can be unhitched from the bottom of the pack and stowed in a non-zipping back panel. Doing this converts the pack into a duffel bag. You can grab a meaty handle on either side to complete the look, though there is no shoulder strap for when you’re using it as a duffle. We find duffles more laborious to carry, so we prefer to use the Wander Pack as a backpack. 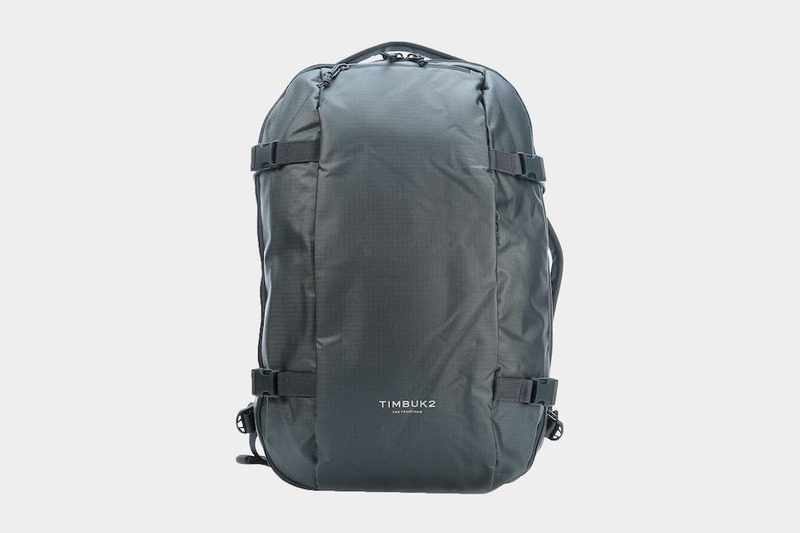 Timbuk2 lists one additional feature, which they say is an “airmesh ventilated back panel.” That doesn’t seem like much of anything, which isn’t a negative. It’s just a typical back of a backpack. Taking all these features into account, the Wander Pack is an impressive specimen. In practice, it did most everything just as well as we’d hope. First, all items were well held in place by the internal compression straps. Second, there were more than enough pockets and places to store what was packed. At no time did any of them seem unnecessary or superfluous; the shoe compartment was convenient and useful. And third, when the pack was compressed down with the four outside straps and put on, it felt good, looked sleek, and sat at a nice height on the back. Where there is good, oftentimes there is something bad, and there are a couple of inescapable negatives about this pack. The first and most glaring is the absence of a hip belt. For a 40L backpack that on its own weights nearly 4lbs, not having one seems criminal, unless you’re packing very light. 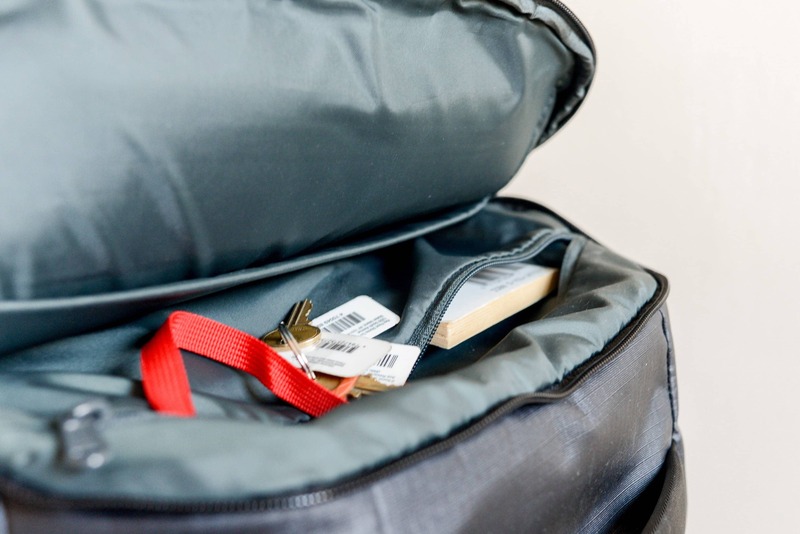 When the bag was fully packed for a two-week trip it weighed between 15 and 20lbs. Wearing the Wander Pack for any substantial amount of time at this weight wasn’t nice. It’s unclear why one—or even the option for one—wasn’t included on this pack. One guess is that since Timbuk2 has traditionally been a company that’s made bags for people living in urban areas a hip belt isn’t a requirement they’ve had. The Wander Pack follows that urban influence, looking like a slick, modern, city-dwellers backpack. All that is fine, but if you’re going to market this as a “legitimate backpacking pack,” then some of those staple features are needed. Namely, a hip belt. A second issue we found when testing this pack is at random times, without any rhyme or reason, the shoulder straps would come unhitched from the pack. There were two or three times over the course of a week when the pack was picked up by the strap, only for it to come up and up and up without the backpack in tow, until finally, there it was. A prompt “what the f*ck” may have been uttered. The issue lies with the mechanism holding the straps to the body of the pack. It’s quite small and finicky. 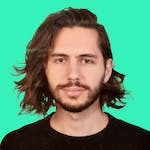 We’ve seen other users complain of this same problem, too. To have a backpack that loses its straps without warning isn’t great. Thankfully, this didn’t happen often enough where it became a serious problem, though the fact it happens at all left us scratching our heads, wondering how much Timbuk2 tested the Wander Pack before release. And finally, the sternum strap isn’t attached at all to the shoulder straps. Usually, these are be sewn or fastened onto the shoulder straps in some way that restricts the movement and provides easy access. That’s not the case here. These sternum straps flop around all over the place. If you don’t have it buckled, there’s nothing preventing gravity from taking them down towards the bottom of the shoulder straps. And if you want to clip the sternum strap when the pack is already on, good luck. Many times the sternum straps would fall so far down the shoulder straps they would become entwined or caught, making it very difficult and truly time consuming to bring them back up into position. Given the aforementioned issue about the shoulder straps coming undone at random times, it’s likely if you’re not careful one of the sternum straps will fall off the shoulder straps and you could very well lose one. Taking these three issues into account, the Timbuk2 Wander Pack is still a great, great backpack. If they could go back to the drawing board and tweak these three little anomalies we found while testing it, this pack would really sing, better than it already does. 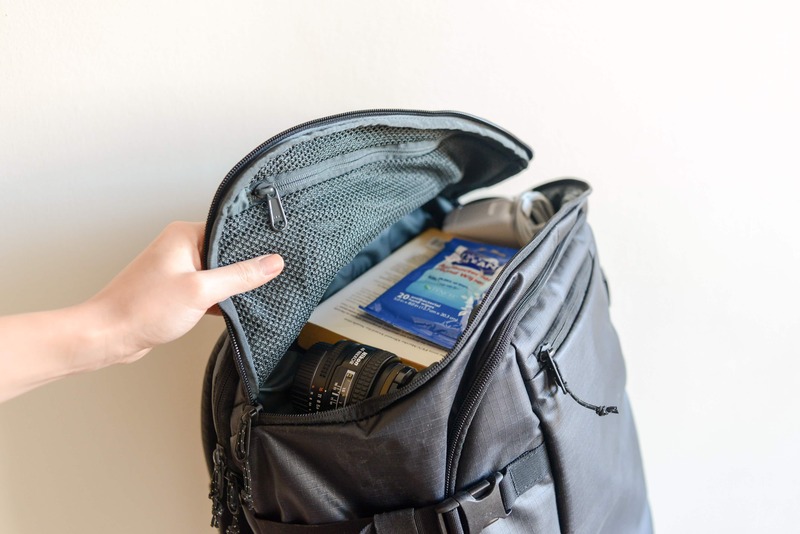 The Wander Pack has plenty of room for all your items, organizes them with ease, and looks and feels great, but we wouldn’t recommend carrying a heavy load all day. Working great. No issues with the durability. A plethora of well-thought-out pockets. Compression strap in the main compartment is very handy. Wet pocket/shoe compartment works wonders. Shoulder straps come undone without warning. Sternum straps aren’t secured to the shoulder straps. 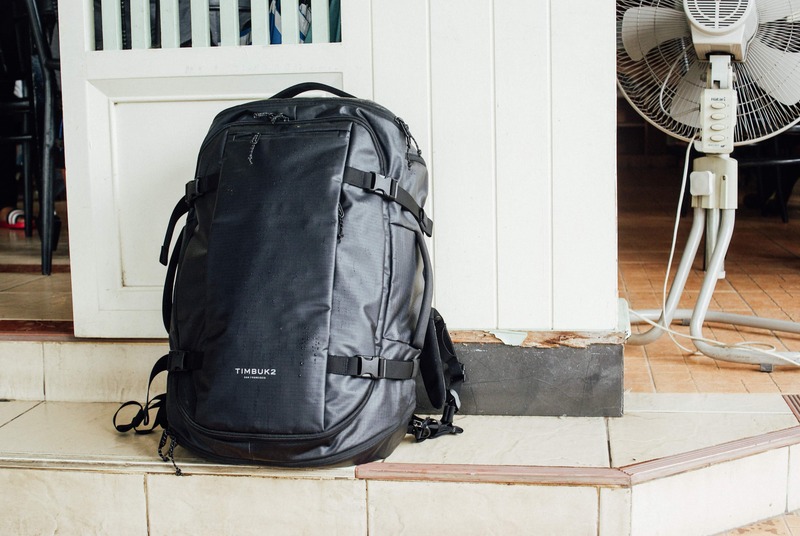 The Timbuk2 Wander Pack is very nearly a perfect travel backpack. The things it does right, with its supremely efficient use of space and well-designed small details, make it hard to beat. If Timbuk2 would update the design to include a hip belt, reengineer how the shoulder straps lock in place, and attach the sternum strap to the shoulder straps, the Wander Pack would be second to none. 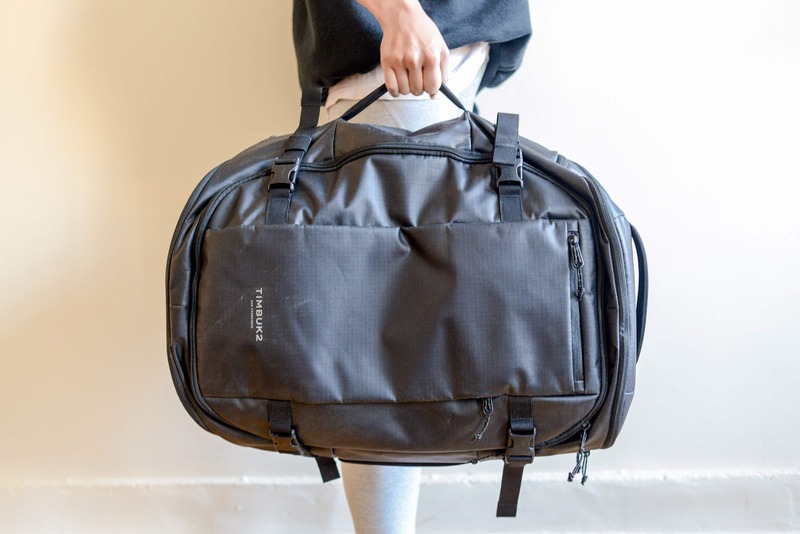 As it is, it’s still a great choice for anyone looking for a carry-on compliant bag that’ll fit everything needed for your travels, no matter how far or wide your journey.